Thanks to our "Dynamic Ads + Pixel" module, you have the ability to identify products in your Instagram photos. It's what Facebook calls the "Instagram Shopping" feature. This feature is currently available only for certain markets (countries) whose list can be viewed by clicking here. Please check also that you have the last version of the Instagram app before following the steps below. Your business must sell primarily physical goods that comply with Facebook Commerce Product Merchant Agreement and Commerce Policies. 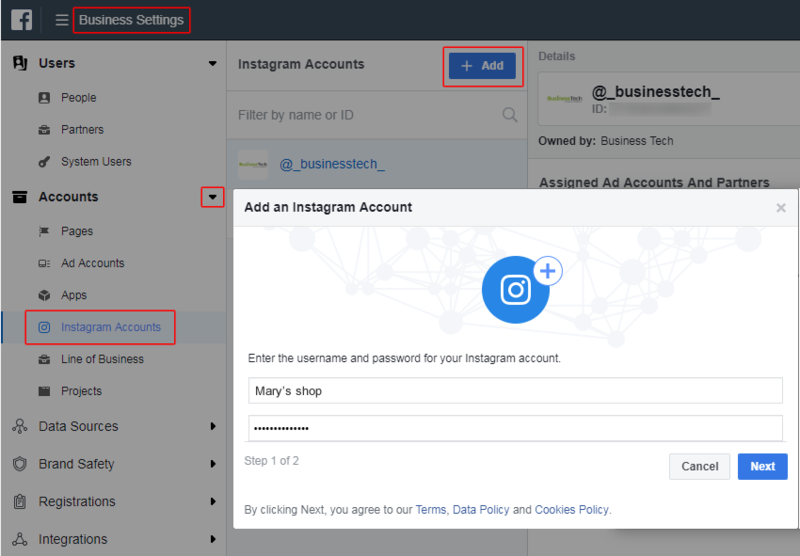 Make sure the Business Manager account you're using owns (access permission is not enough) the Facebook Page you will link to your Instagram business account. Make sure that you are the admin of the Facebook Page you will link to your Instagram business account. Make sure that the Business Manager account owns or has access to the catalog that you will use. Convert a personal Instagram profile into a professional one. Click here to find out how. You will be asked to associate the profile with a Facebook page that you manage. Select the correct Facebook page and continue. Please note that converting your profile in a business profile will allow you to access the Instagram Insights feature. This feature allows you to learn more about your follower, about who is engaging with your business, and about how your content is performing with your audience. To know more, click here. In the Business Manager interface, click on the three horizontal bars of the menu, hover over "All Tools" and in the "Settings" column select "Business Settings". In the column of the left menu, in the "Accounts" section click on "Instagram Accounts". Click "Add" to add your professional Instagram account in order to link it to the Business Manager account you own. 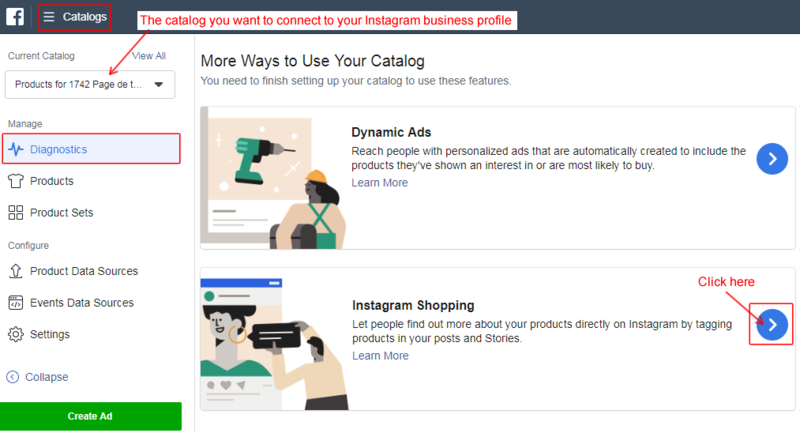 Create a catalog in the Business Manager and import your products or import your products into the catalog connected to the shop tab (native) of your Facebook page. Warning: Make sure you are the administrator of the catalog. You should see your Instagram business profile appear. Select it and save. Your catalog is now connected. 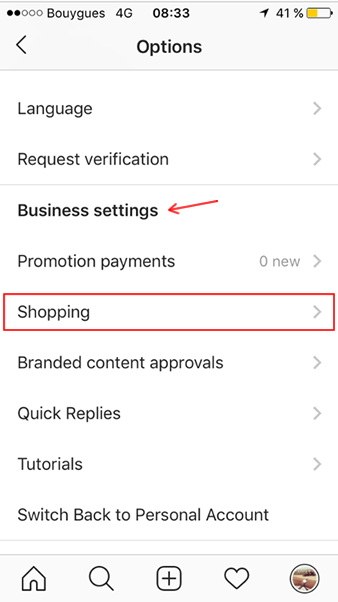 If your account is approved, you will receive a notification on your Instagram business profile (the message will appear at the top of your Instagram app screen). 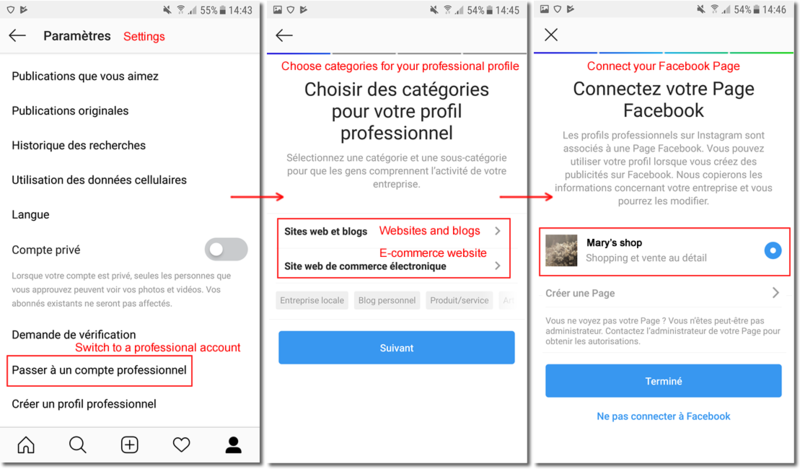 Once your Instagram profile is approved for the Shopping feature, you can identify your products on your publications. You can tag up to 5 products per single-image post or 20 products per multi-image post. To read the Instagram official procedure for tagging products on publications, click here. Instagram Shopping also allows you to feature products or add product stickers in your stories. Click here to know how to do. To read the complete guide of Instagram Shopping feature setting up, click here.